This rural property was bought with other family members to allow everyone to live together on the same piece of land and enjoy all aspects of life together. Because of this, the property’s second home required a lot of fine tuning for our design team as it had to fall within a specific interior square footage maximum limit of 1020 due to the local bylaw zoning requirements for a “secondary detached dwelling”. Working closely with our team, the home owner created a home plan that includes 1019 square feet of finished interior space. The two-story home features an open concept living area that includes a living room, kitchen and dining room. 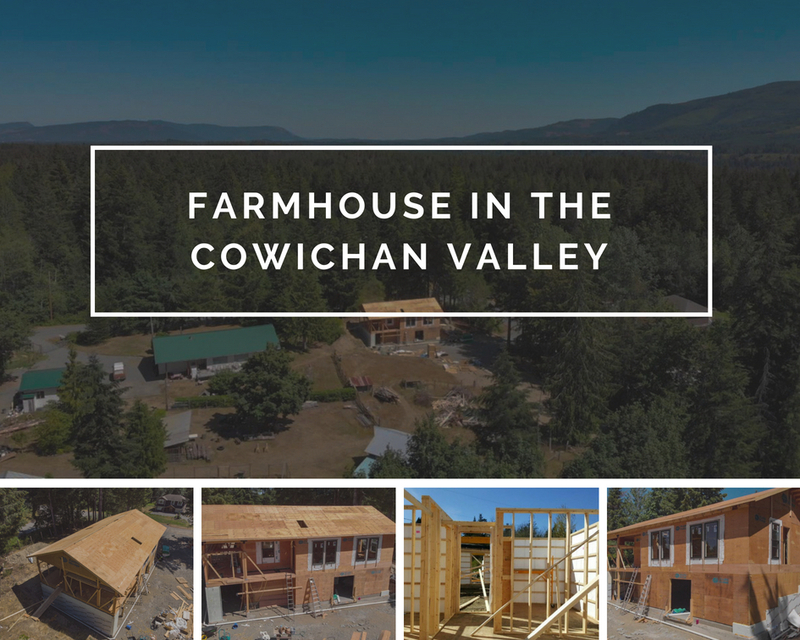 The home’s 9+ foot vaulted ceiling areas and expansive windows open the area up and allow for the home owners to watch over their farm from the comforts of home. Its elevated deck will provide a relaxation zone to spend with family enjoying the pleasant Vancouver Island weather. The lower level is an equal size and will be used as a garage, workshop and storage area. This home’s owner decided to build and permit the project himself as an owner-builder and started the process by taking the OBT Training Course here at the Pacific Homes Cobble Hill office in preparation for the required exam. If you are interested in learning more about our OBT Training Course, you can find more information here. As the home draws nearer to completion, the homeowners are excited to move in and focus on what’s most important to them.